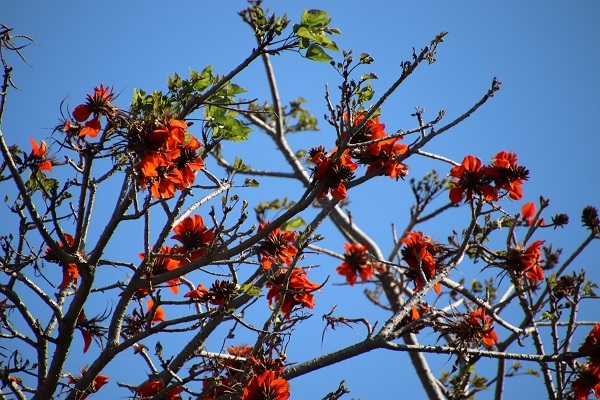 At this time of the year the brilliant scarlet flowers of the coral trees are giving way to the bright green of new leaves. Soon black pods will form that will, in time, pop open to reveal the hard scarlet seeds. 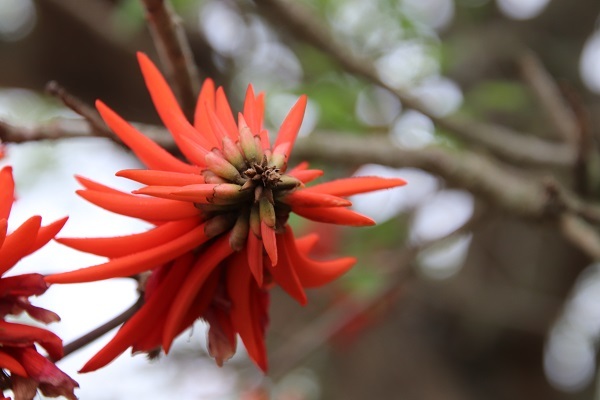 The trees in our garden are all Erythrina caffra, which has a fairly limited distribution along the coastal regions of the Eastern Cape and Kwa Zulu Natal – which is why it is sometimes called the Coast Coral Tree. 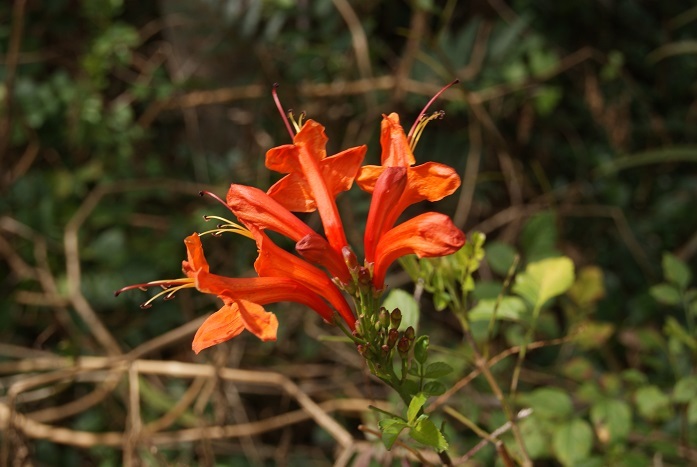 Their vermillion flowers are the most common variety, which you can see in combination with the new leaves in our back garden. 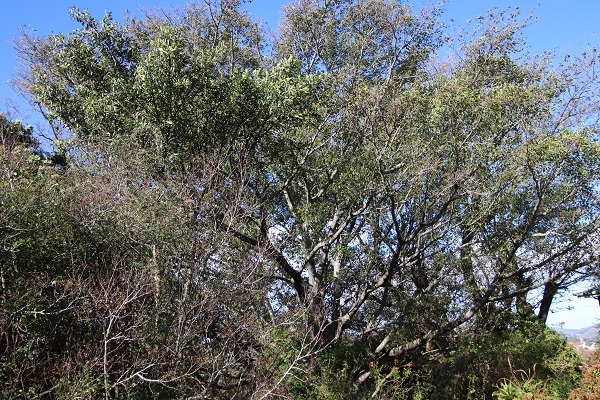 Some trees bear flowers that are more orange and others cream-coloured flowers, such as this specimen photographed in Port Elizabeth. 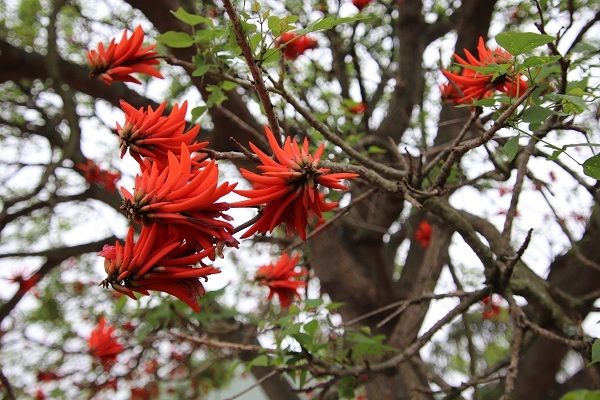 The tree I grew up with in Mpumalanga, is the widely distributed Erythrina lysistemon. 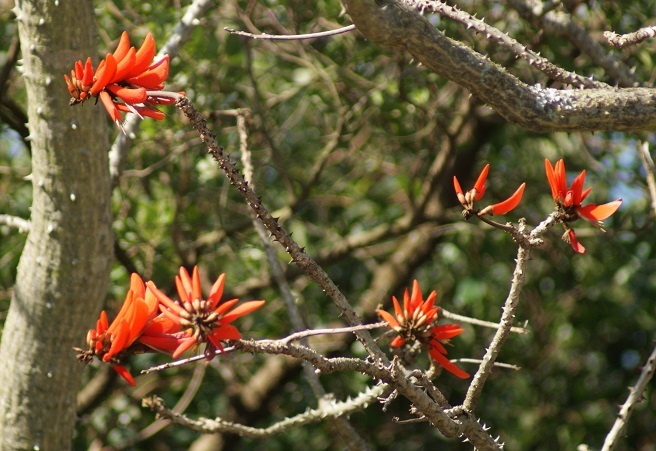 Because it grows over much of the country, it is known as the Common Coral Tree. 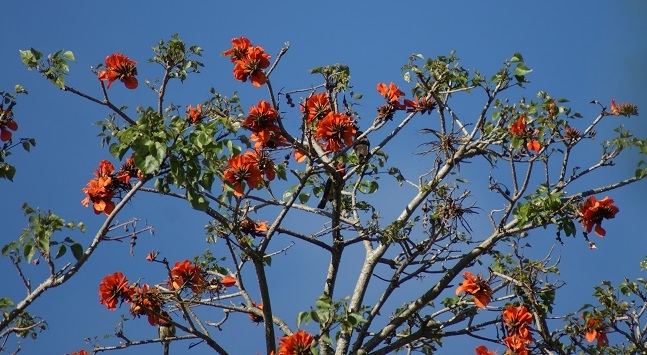 It is a particularly spectacular tree as the flowers are usually a bright scarlet. 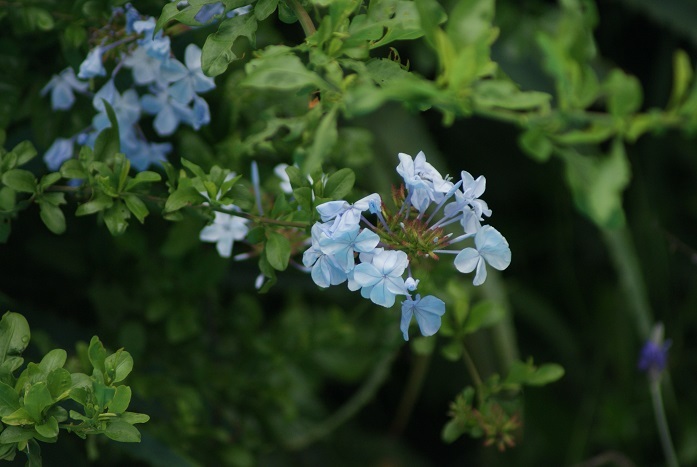 They produce abundant nectar that attracts many birds and insects. 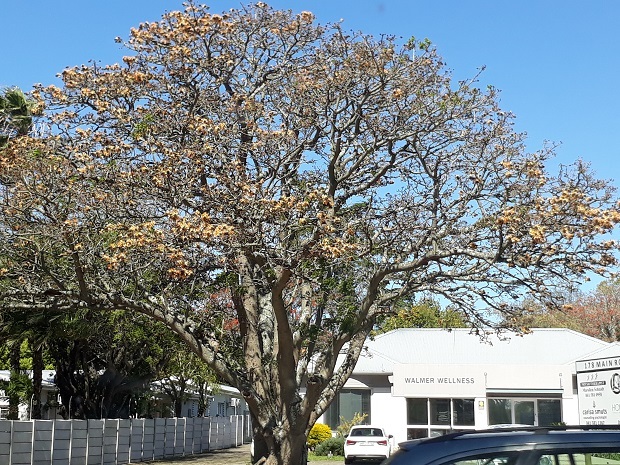 Several of these trees have been blooming in and around Grahamstown. 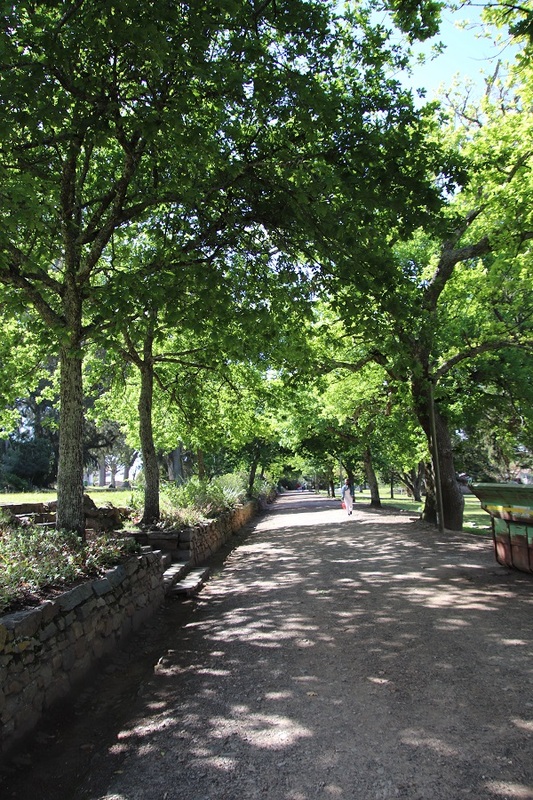 The Botanical Gardens in Grahamstown are situated on land granted to the Albany Botanical Gardens by the Governor of the Cape Colony, Sir George Cathcart, with the transfer of Erf 3282 being passed on 19th October 1853. More land was allocated to the project a year later and the gardens have expanded since then. An avenue of oak trees runs through the centre of the gardens – clearly these are replacements of the original trees. This was the oldest plantation of oaks in or near Grahamstown at the time. This avenue historically formed an important carriageway from Lucas Avenue to Mountain Drive. 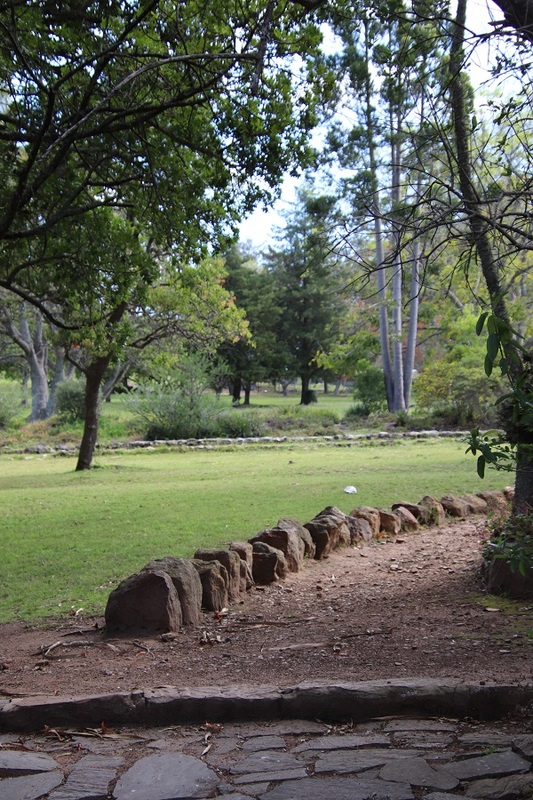 The gardens, affectionately known as ‘Bots’, but now officially called Makana Botanical Gardens, are adjacent to the beautiful campus of Rhodes University. Owing to the neglect of the gardens over a number of years, a rehabilitation and redevelopment programme was initiated by SANBI between 2004 and 2006. 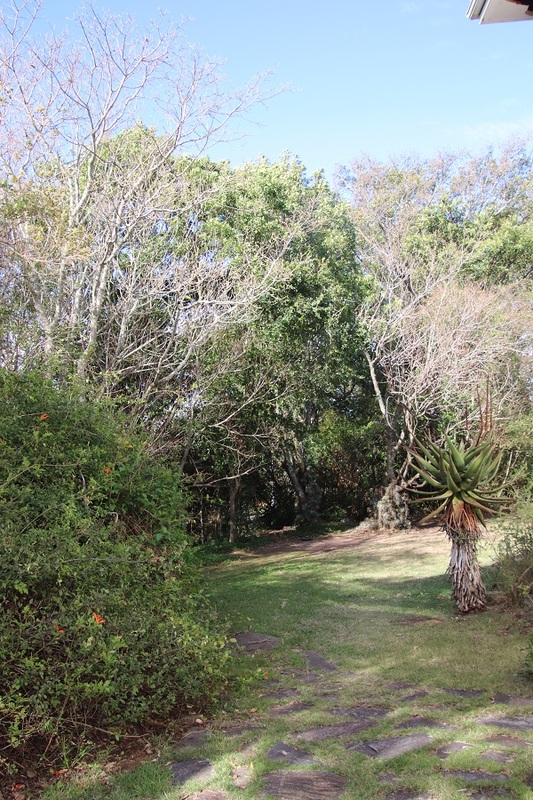 The Makana District (formerly Albany) granted Rhodes University a 99 year lease on the understanding that the gardens would be maintained by that institution during that time. For some time afterwards the gardens were a joy to walk through with a variety of indigenous flowers blooming at different times of the year and an interesting array of paved paths winding up towards the top of Gunfire Hill. The paths are still there but an air of genteel neglect is pervasive. Given the prolonged drought, it is perhaps understandable that the lily ponds have been drained. One of these lily ponds was created to commemorate Captain Fordyce (who died in the Amatolas in 1851 in the War of Mlanjeni). 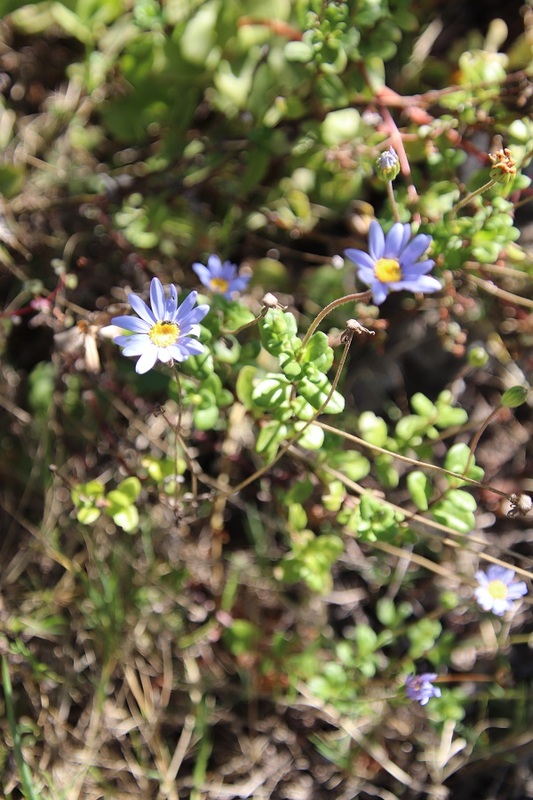 Only the hardiest of flowers are blooming in the overgrown and neglected garden beds. One being Felicia aethiopica. The other is a Sour Fig. 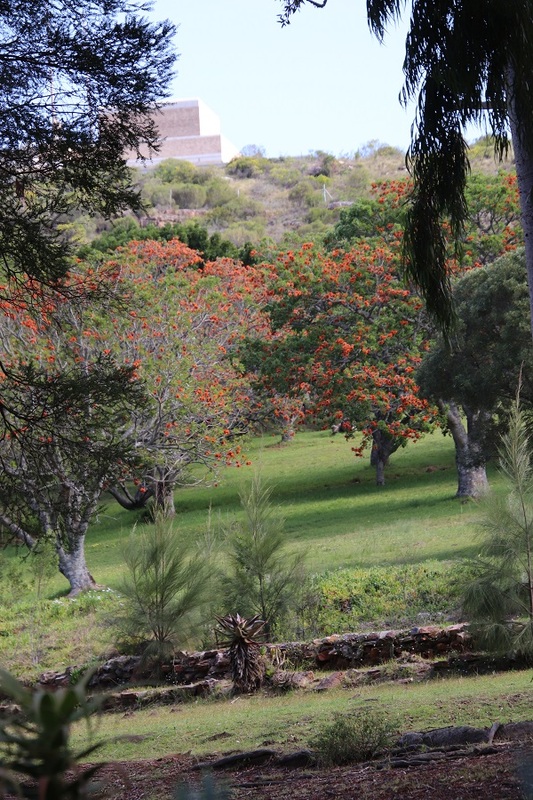 A number of mature trees have survived both drought and neglect – there is a lovely grove of Erythrina caffra. 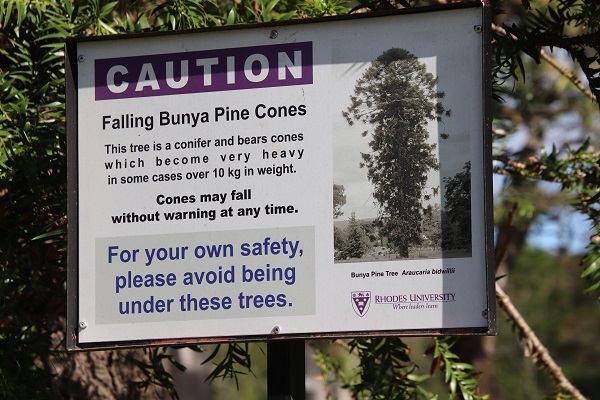 The very tall Bunya Pine Tree (Araucaria bidwillii) near the entrance has a sign warning visitors to be careful of falling pine cones. Read the sign and you will understand why! 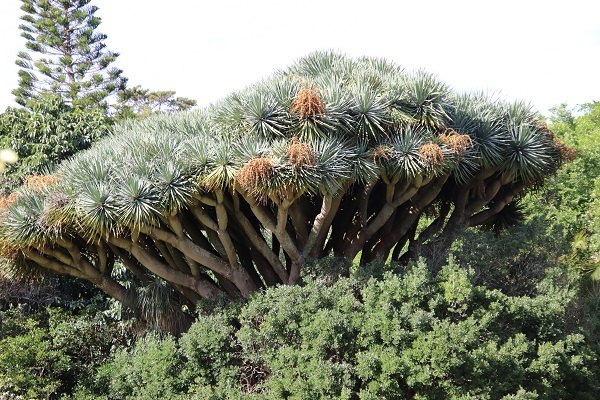 This and other exotic trees hark back to an era when the gardens showcased plants from all over the world. A military cemetery, dating from 1819 to 1822, lies within the grounds of the botanical gardens – overgrown with grass and weeds. A seedling white ironwood is growing right next to one of the head stones. 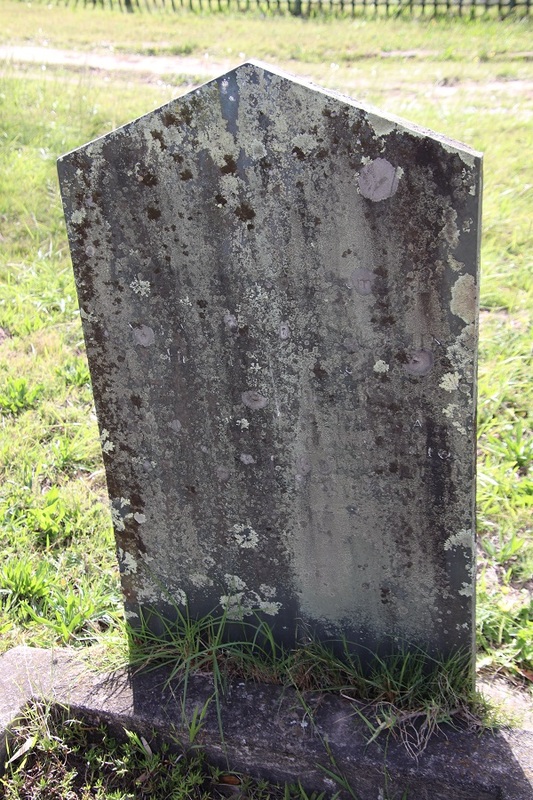 Apart from one, the remaining headstones can no longer be read because of weathering and the growth of lichen on them. 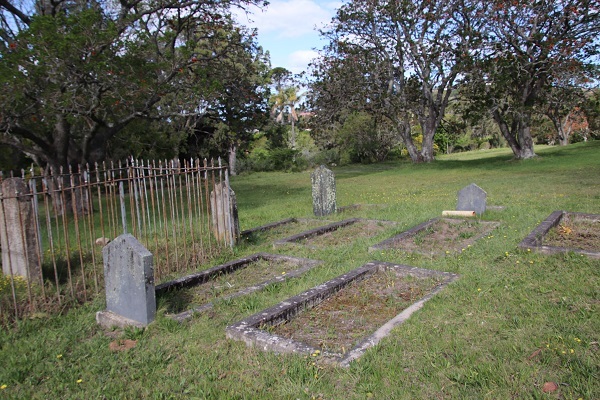 The earliest grave is that of Captain R. Gethin, who died in the Battle of Grahamstown in 1819. 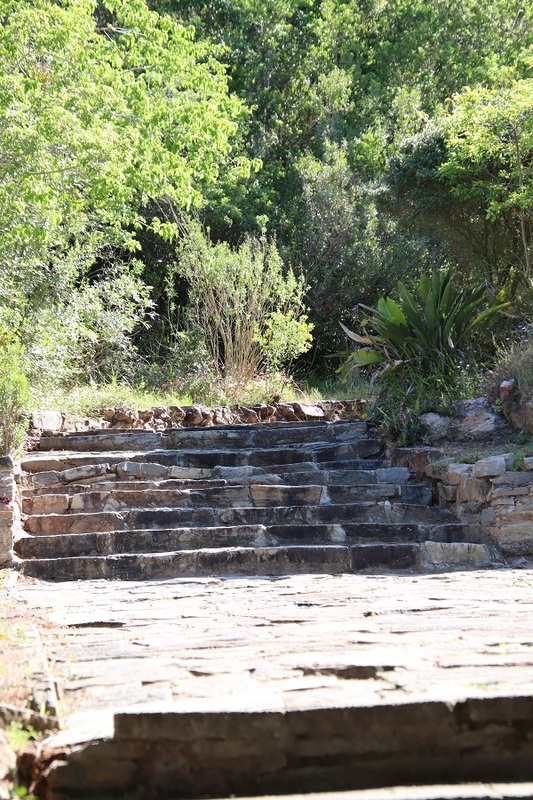 These botanical gardens, once part of the Drostdy Estate, are the second oldest in South Africa and bear the status of a Provincial Heritage Site. They were officially proclaimed a National Monument in July 1984. The theme for this year’s Arbour Week is Forests and Sustainable Cities. My garden is a microcosm of this and could be termed Forests and Sustainable Gardens. Early readers will know that we inherited a rather barren garden and set about planting as many indigenous trees as we could soon after our arrival. 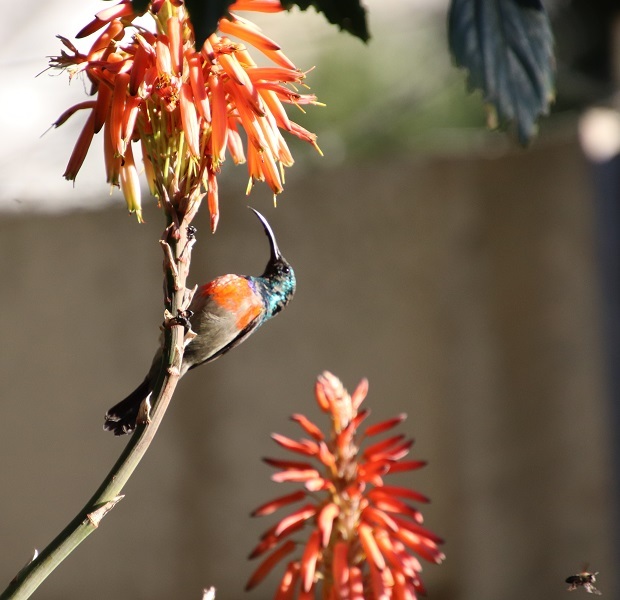 The initial hard work has paid off: we may not have a prize-winning looking garden, but the intention has always been to provide a haven for birds and other small creatures – including snakes that find their way here – such as at least one tortoise and a Brown Mongoose. 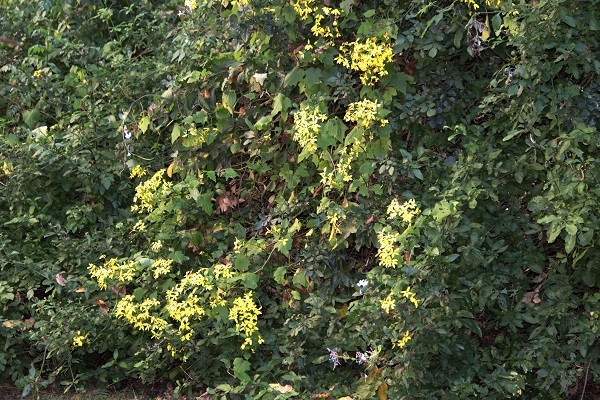 One of the highlighted trees of the year is the Boscia albitrunca, otherwise known as the Shepherd’s Tree. We do not have one in our garden, but see them growing in the wild around here. 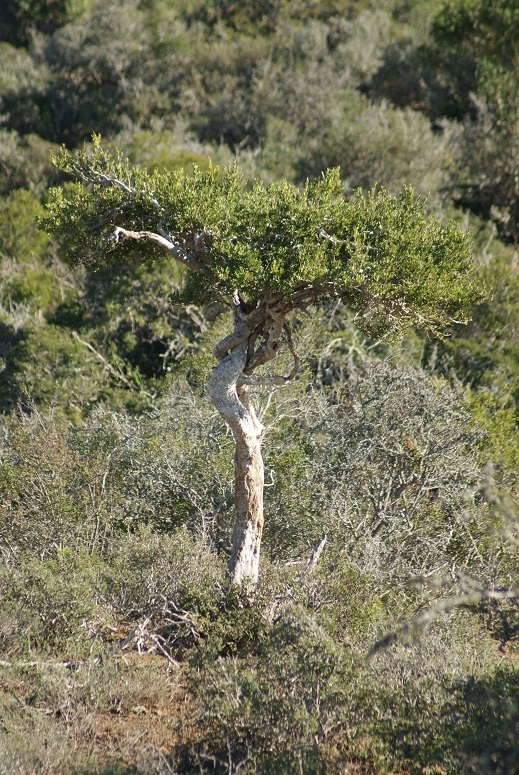 A lovely example is this one growing in the Great Fish Nature Reserve. 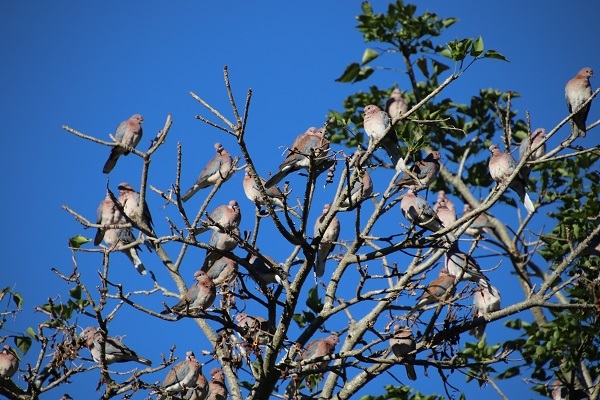 I often mention the trees in our garden and the birds that use them for either food or shelter. 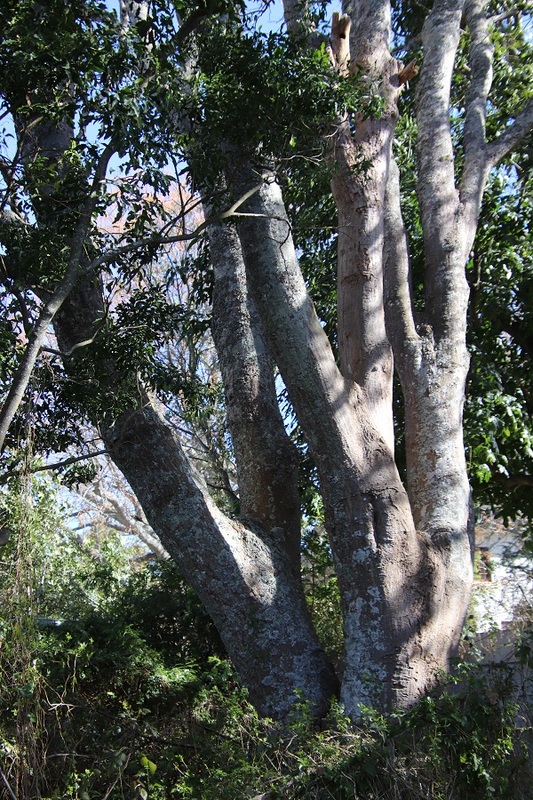 This is the enormous Natal Fig that dominates the ‘wild’ section of our garden. 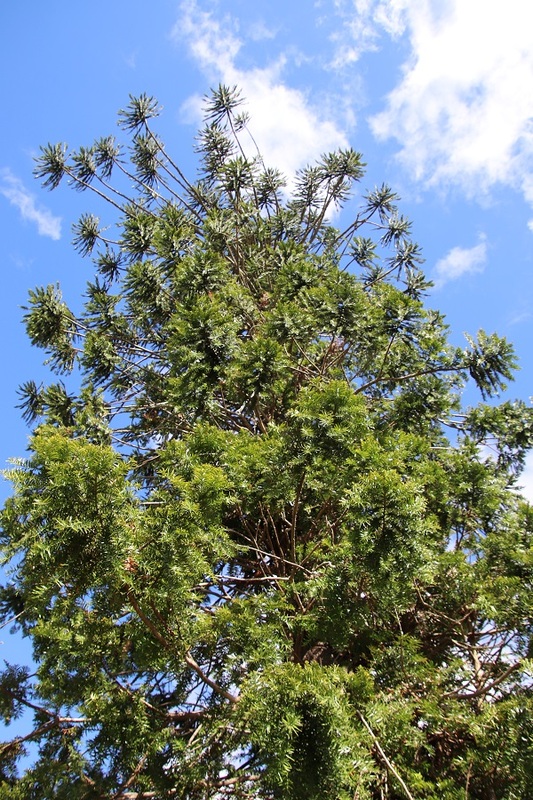 It must be at least seventy years old, having been planted soon after the end of the Second World War when our house was built. It is looking a little bare at the moment, yet will soon be covered with thick foliage. A flock of Hadeda Ibises roost in it every night and a variety of birds feed off the tiny fruits. 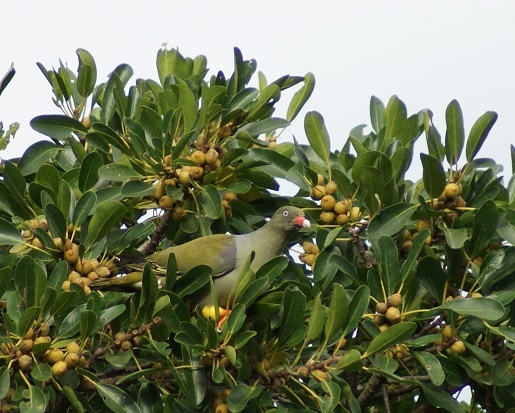 These include African Green Pigeons, Blackeyed Bulbuls, Cape White-eyes, Blackcollared Barbets, Blackheaded Orioles, Greyheaded Sparrows, Olive Thrushes, Knysna Turacos and many more! 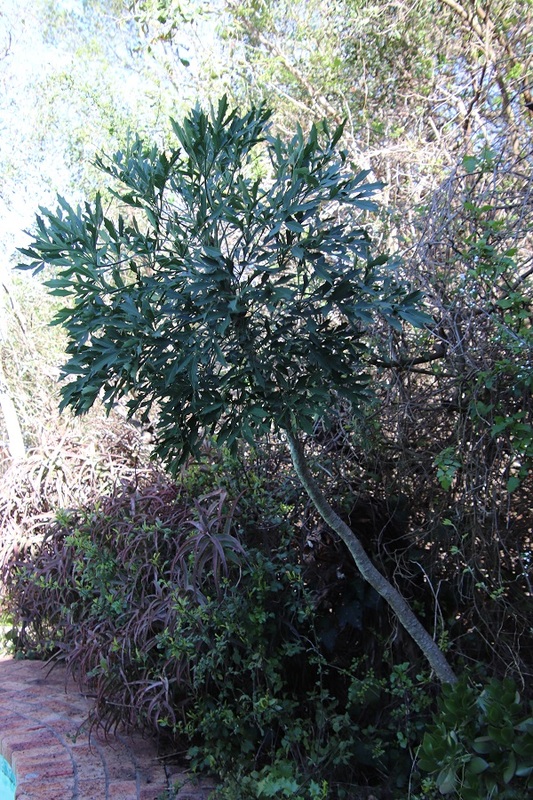 This Cussonia spicata (Cabbage Tree) was grown from seed by a friend. As you can see, it has had to bend away from the encroaching ‘jungle’ to reach the light. Keeping that ‘jungle’ in check is an ongoing battle – which I am nowhere near winning, yet it provides a perfect haven for nesting Cape Robin-chats, Cape White-eyes, Fork-tailed Drongos – and is where we have seen several snakes. 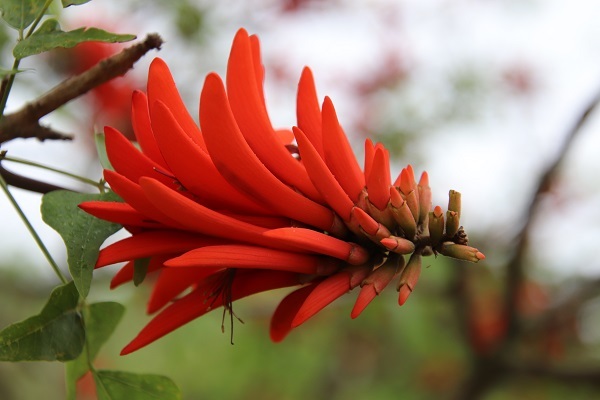 Whenever I mention the Erythrina caffra trees in our back garden, I tend to show you what its magnificent flowers look like. Here you can see the base of one of these trees. They are enormous and are also very old. Near the top of the picture you can see where some of the branches have shrivelled with age and fallen off. I will leave you with a partial view of our front garden. Work nudged me towards Kenton-on-Sea this morning. 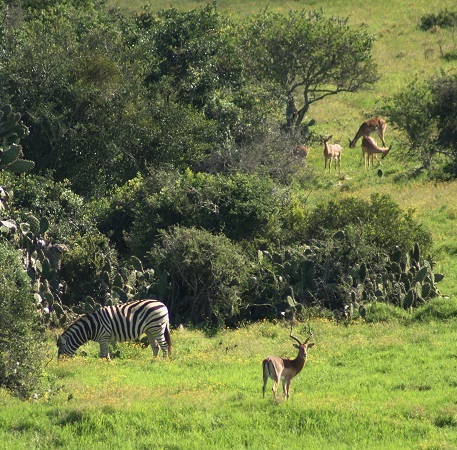 One approaches this seaside village through a farming area, which includes some private game reserves. 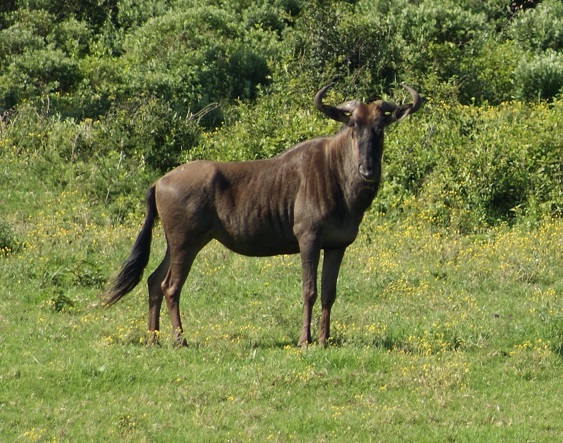 It gave me a lift along the way to see a zebra and some impala grazing near the road. There is an obvious infestation of prickly pears, clearly evident in the image below, that do not belong in a pristine natural environment. One has to bear in mind though that most of these private reserves were originally farmland. Prickly pears originated in Mexico and were introduced to South Africa a couple of centuries ago. 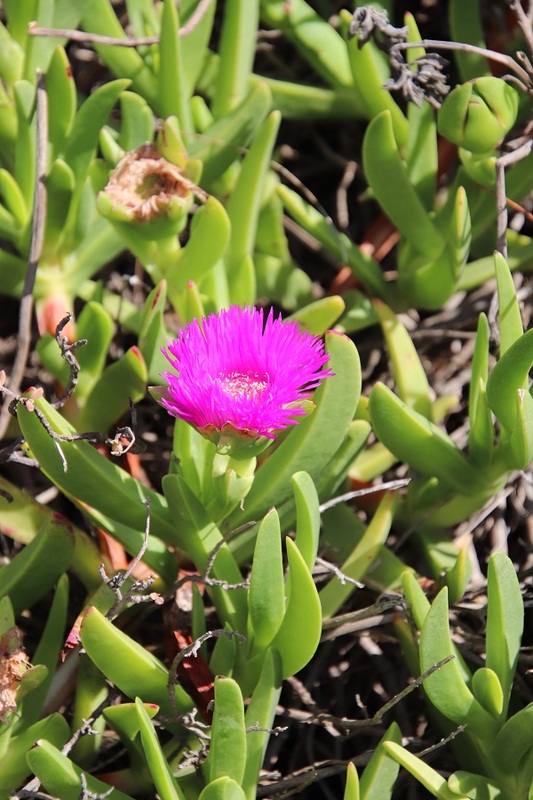 These plants are viewed as a scourge by some farmers because of their invasive qualities, yet others regard it as a good source of fodder for their animals in the more arid parts of the country. The fruit of the prickly pear is regarded as a delicacy by many and I passed some people picking bucket loads this morning. 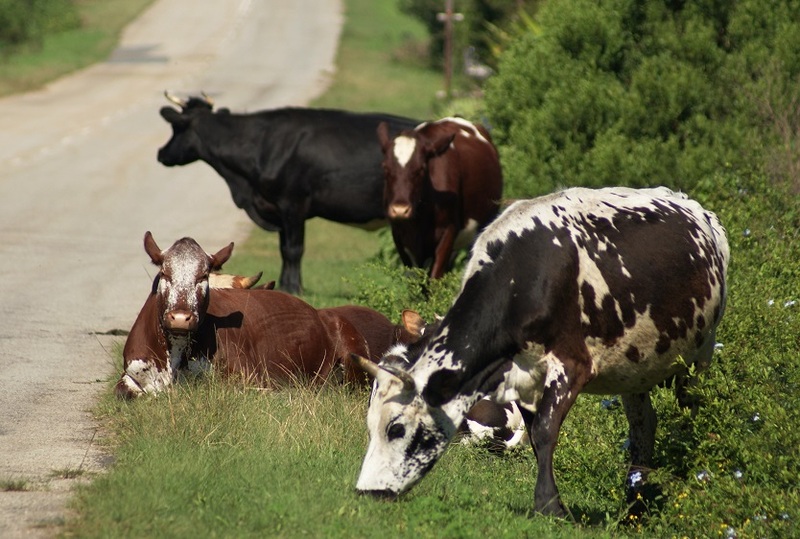 As Kenton-on-Sea came into view I was struck by the cattle grazing on the grassy verge – shades of what often happens these days where I live! 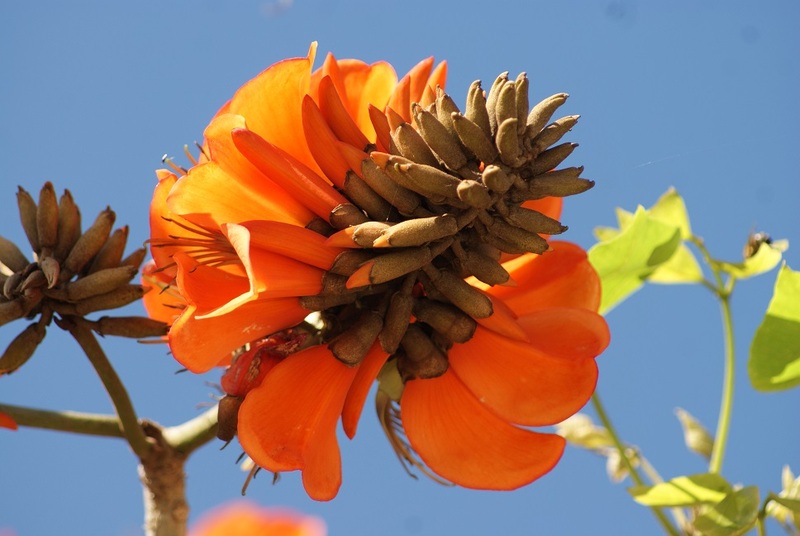 At this time of the year the Erythrina trees are coming into bloom and today I was fortunate enough to see both the Erythrina caffra and the Erythrina lysistemon. 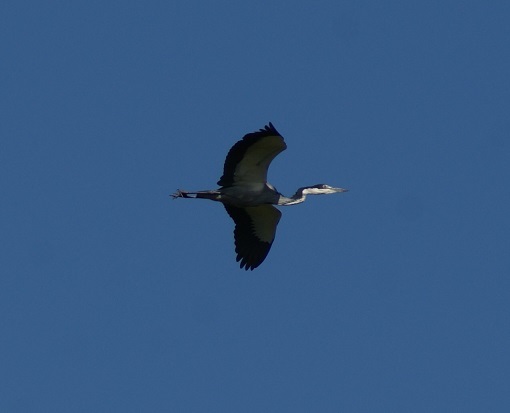 A black-headed heron and a black wildebeest added to the joy of spending the best part of the day away from home.